Sinsheim - In-form VfL Wolfsburg produced a stylish display to defeat 1899 Hoffenheim 3-1 in the Rhein-Neckar-Arena and make it three wins in their last four matches. Early goals from Makoto Hasebe and Bas Dost put the Wolves comfortably in front, and a Naldo free-kick put the result beyond doubt. Hoffenheim's only crumb of comfort came late on when Eren Derdiyok stuck a late consolation. Following on from their impressive performance in the 3-1 win against Bayer 04 Leverkusen last weekend, Wolfsburg started confidently, enjoying the greater share of possession and looking sharp in the final third. Hasebe went close inside the opening few seconds, but the Japanese international made no mistake soon afterwards, heading home Ivica Olic's deflected cross. Hoffenheim reacted well, with Roberto Firmino forcing goalkeeper Diego Benaglio to keep out his stunning 30-yard-drive and Andreas Beck hitting the wrong side of the post from a sharp angle. 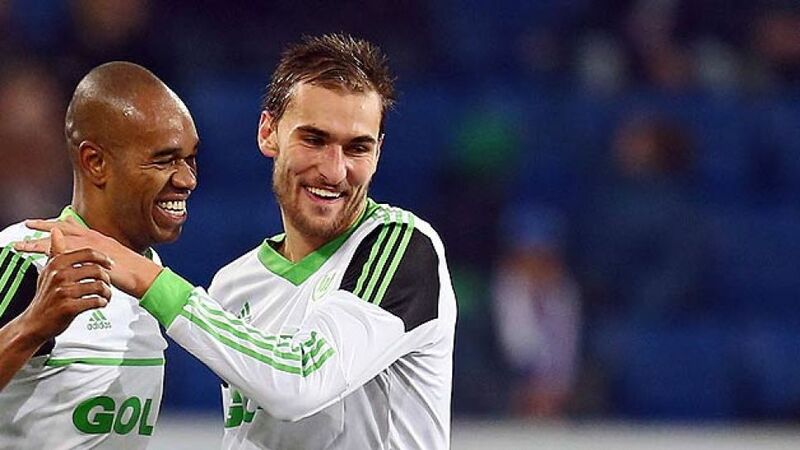 Yet they failed to really hit their stride, making it relatively easy for Wolfsburg to dictate the exchanges. Wolfsburg merely had to wait for their opportuities, and they doubled their lead on 24 minutes. Dost collected Josue's pass after a defensive blunder by 1899's playmaker Firmino and fired home for his fifth goal of the campaign. Hoffenheim tried to up the pressure as the half-time whistle approached, and Daniel Williams forced a good reaction out of Benaglio. The Swiss goalkeeper then pulled a spectacular save to deny Sejad Salihovic, who then squandered the home side's best opportunity before the interval, heading Joselu's headed pass straight at the keeper. The home side attempted to up the tempo of their game after the break and committed more men forward. Kevin Volland twice threatened the Wolves' goal, the Germany Under-21 international seeing his effort bounce off Simon Kjaer and then hesitating in the box to allow a defender to intervene. Unsurprisingly, 1899 left gaps at the back and Dost had an attempt cleared off the line by Mathieu Delpierre, before Diego missed the target just six yards out. As the clock began to wind down, Joselu twice only had Benaglio to beat but inexplicably shot over from close range after a goalmouth scramble, while another strike from Salihovic was also palmed away. But the points were then decided on 78 minutes, as former Werder Bremen defender Naldo's smashing free-kick from distance left his ex-teammate Wiese no chance. Hoffenheim's Derdiyok managed to make it 1-3 just before full-time, poking home after his initial effort had struck the crossbar. It may have ruined the Wolves' clean sheet, but that won't matter to them after a more than satisfying away day victory.